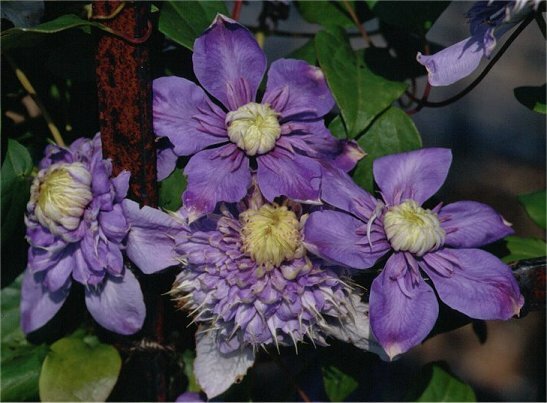 Most lovers of clematis have probably met with a gardener or garden visitor who confided, amiably enough, "I don't much care for the doubles," and then promptly fell head over heels at the first sight of 'Veronica's Choice' in full bloom, or an old charmer like 'Mrs. Spencer Castle.' And the reason is not far to seek. The doubles and semidoubles come in such a multitude of different formsbig ones and little ones, fat ones and thin ones, quiet ones and busy onesthat hardly anyone can safely claim to have seen them all, or checked out all the changes that can occur to them, going from one climate (or one season) to another. In the doubles there is always new ground to be discovered. All that a garden center needs to see them go straight out the door in Springtime, we are told, is to have one of the plants in bloom. Doubles that are not deliberately bred from other doubles start in accidents of naturemutationsand might be lost in exactly that form if someone did not catch sight of them and set them up for propagation. That is the story with C. 'Blue Light'(N). It was found by the Boskoop nurseryman Frans van Haastert amongst his newly rooted plants of C. 'Mrs. Cholmondeley,' whisked out and grown on for propagation, and introduced in 1998. It promptly won an Award of Recommendation from the Royal Boskoop Horticultural Society, and applications went in for Plant Breeders Rights to it in Europe and a Plant Patent in the United States, to protect it from being pirated by unauthorized growers. Along the way it has picked up the cultivar name 'Vanso,' the status of which is not quite clear. Few clematis have had so wide a dispersion across the clematis market in so short a time. Looking at the flowers above, it is easy to see a resemblance in form to another double not much older, the pink-flowered C. JOSEPHINE'Evijohill'(N), also a protected plant, from Raymond Evison's nursery in Guernsey. They have much the same sort of many-levelled intricacyone is tempted to think of them as double doublesand the same habit of unfolding one layer at a time, so that the full performance takes many days, and they both have the fairly unusual ability to bloom double the second time around, in late summer or early autumn. Some of the flowers will probably come up semidoublethere is one such in the photograph at the top, and here is another that we could better call a single, though it too has more than one string to its bow. These are likely to be more common in the late bloom. But one of the most appealing traits of the flower comes in its declining phase, when the layers start to fall awayfirst the large sepals at the base, and then the plumage of the inner layers, leaving at last only the ruff at the center, now fully expanded, which can stay on the stalk for weeks. 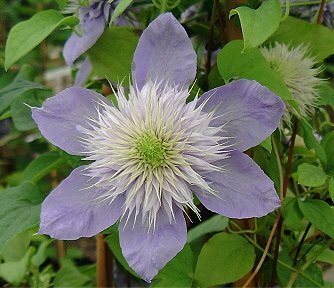 This is a character it shares with more familiar clematis like 'Multi-Blue' and the florida twins, var. sieboldiana and flore-pleno. Newcomers to these plants, who may not know them in their showier condition, often seem quite satisfied with this last act in the drama. 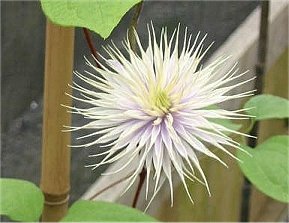 It should be said that we have not had this clematis under garden cultivation for very long, and the book on its performance is short. We do not know how it will respond to all the many diversities of climate it is facing for the first time. But as yet there is no reason to think that this double double is going to be followed by toil and trouble. On the evidence so far, it is a valuable and well-behaved recruit to the trade, and if demand exceeds supply this year, there should be more, the next time around.